This week Angie Avestruz at AirVuz headquarters gets us caught up on what’s happening in the World of Drones. Over the weekend, content creator dramafree uploaded an insane FPV drone video (https://www.airvuz.com/video/Monster-Trucks?id=5c8dc0604c75ef639fc50e03) of his Shendrones Squirt V2 flying around at a monster truck rally. Drones are making headlines all over the world this week. Canadian drone pilots (https://www.airvuz.com/video/The-Beauty-of-Frozen-Qu%C3%A9bec--Aerial-Film?id=5a6f7bc29a3ac45fed261576&ccid=5854531aa1c14a26d789e97e) are happy that DJI just announced that nine of their drone models now comply with the new Transport Canada requirements for advanced operations. In Switzerland (https://www.airvuz.com/video/The-Magical-Switzerland-in-4k?id=59dcac2035a8144ea2bdd838&ccid=585950e04869ef72a00ddd9f), the Federal Office of Civil Aviation announced it plans to require UAV pilots to register themselves and their drones as early as 2020. And starting this Wednesday, the no-fly zones surrounding United Kingdom (https://www.airvuz.com/video/London?id=5a6f5517e5a1c56222bf71ed&ccid=591478d63d7b9656c82d4670) airports will expand to a 3 mile radius. Tomorrow we will announce the winner of the Drone Video of the Week contest. Check back tomorrow to see who will be walking away with $250 based on your votes. Johnny Schaer aka JohnnyFPV (https://www.airvuz.com/user/johnnyfpv/videos) still sits in the #1 position of AirVuz’s Top 100 Content Creators (https://www.airvuz.com/top-content-creators) with Timelab.pro and Grim Berge trailing not far behind. AirVuz is putting together a collection (https://www.airvuz.com/collection/game-of-thrones-filming-locations-from-above-best-of?id=rkU4j4p2-) of all of the best drone videos of real-life filming location from the HBO hit show, Game of Thrones. If you think you have a drone video that should be in our curated collection get it uploaded to AirVuz.com. 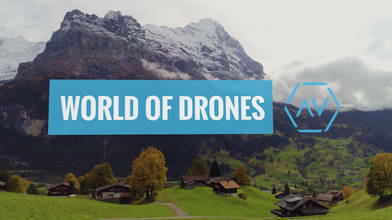 Thanks for tuning into the first edition of World of Drones. We’ll see you next time!